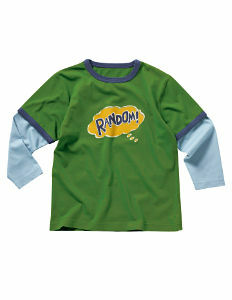 This one goes up to a size 18 — well, a size 18 MONTHS. 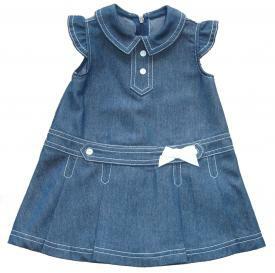 It's from justdresses.co.uk, which has all sorts of adorable little dresses for adorable little girls. You know how, when you were a kid, you thought up ridiculous "jobs" that no one would ever pay you to do? Like "ice-cream taste tester" or "cartoon funniness rater"? Well, I've thought of a new one. I'd like to be a style consultant/personal shopper for little girls ages birth to about eight or nine. Talk about an easy job … finding cute clothes for little girls (at least until they hit the way-too-sophisticated tween years) is like finding ice in the arctic. They have all those great tights, all those peter pan collar blouses, and, of course, everything Oilily sells. (Warning: that last link is a really craptastic Flash site.) You could put together a cute little girl's outfit by randomly selecting any three items from their closets — I mean, that's how they do it, after all! I don't know what it is, but I've seen this Cynthia Steffe dress three times now and it resonates with me more each time. Maybe it's the lasered lace on the sleeves and hem of the overskirt, which is so girly and dainty combined with the serious gray flannel. This isn't quite wearable the way it is — even leaving out the fetish gloves, and how fun will it be to see what Google ads the words 'fetish gloves' bring to this page, huh? Maybe I should start seeding these entries with completely random words, like 'pumpkin jambalaya' or 'customer-centered light-arms manufacture' — I'd rather see 3/4 length bell sleeves with the lacework at the hems than these little cap sleeves, but if just that one tweak were made I could see wearing this all the time, with tights and short boots. Looks like it's back to seventh grade for me! Only this time without the orthodonture or the algebra, thank god. Several of you have sent me a link to this lovely dress from Boden, which comes in at least three colorways, most of them brown. I am intrigued by this version — I like the higher neck and longer skirt as being more likely to insinuate extra inches (vertical ones, not horizontal ones!) onto one's frame, and it's rayon so it should be nice and flowy. But on the other hand, I do have a lovely light twill coat from Boden in a crazy orange, blue, and khaki floral pattern that I wear to DEATH in the fall and spring. It goes well with my stripey orange skirt. I love floral and stripes together. I bet there's some online sanity test somewhere that takes points off for admitting that, along with "I often make silly faces when I'm alone" and "I often imagine what things would look like upside down and inside out." Boden does tend to sell out quickly, so if you want this (at $128) I'd order fast. Half the colors and sizes are already on a three-week wait, although that would get you your dress right in time for the first possible moment you could wear it, at least here in Chicago. I'd like to make one of these in a similar cut, only in two different patterns of men's charcoal wool suiting. Maybe even with flap welt pockets. I think it would be deliciously ironic, although that's not quite what one should plan one's fall wardrobe around. Maybe that's a question on the test, too: "I often dress to tickle a sense of humor shared by very few." Even the dog's a winner! Dana just sent me this gorgeous little number that's listed now at Scissor Happy. If only it were slightly bigger! I love the combo of the full skirt, midriff band, and mandarin collar, and, by golly, it looks like the judges of the dog show do too, because you can't tell me that they went by the merits of the pup alone for this one … oh! maybe it's a DRESS contest, and she just brought her dog along for support! 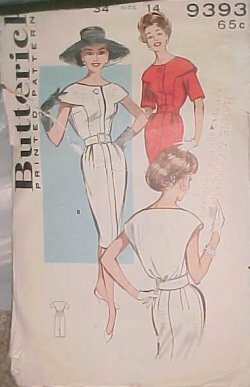 Check out the other stuff at that site — they also have one of the easiest and quickest vintage patterns I've ever made up, Advance 6675. Seriously, you could make it in your sleep wearing boxing gloves. My copy was missing the directions and it STILL went together like a dream. Well worth the price, if it's in your size. This morning when I woke up and ran out for the paper (the copy I grabbed didn't have the magazine, boo, hiss — good thing there's another copy waiting for me at home) there was that smell in the air that says summer is ending. Just a hint of cool crispness — nothing obvious, no sere leaf floating to the ground in front of me, no bus rumbling by displaying an ad for cable-knit tights — just that scent in the air. 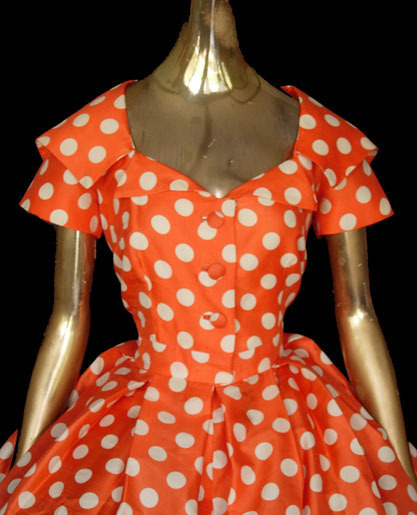 So how could I bid on such a squeezed-orange hot-July-nights dress like this when (if previous Augusts are anything to go by) I'll be thinking about buying wool jersey in deep colors in roughly seventeen days? I love the short-sleeved version shown here, especially with that hat. 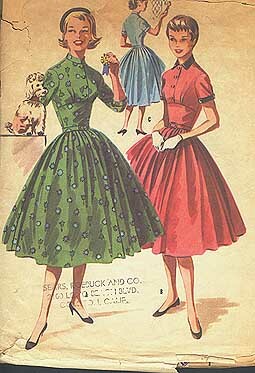 What kills me, though, is that I can't think of any modern equivalent to a dress like this. What does a woman wear these days that is so simple and yet so un-girlish? Low-rise jeans? Please. I'm thinking about this as today is my 35th birthday (yay!) and, even though I'm glad that I can just toss on a pair of sneakers and jeans any time I so choose, there's not an equivalent freedom further up the scale. Why is there this big gap now, where people are either wearing jeans or a cocktail dress (or, actually, jeans and a top that looks like the top of a cocktail dress, instead of the cocktail dress)? Where did all the intermediate stages go? (I mean, besides my closet.) It is a puzzlement, to be sure. Anyway, now that I've achieved ostensible maturity, I plan on wearing a LOT more dresses like this, to fill in the gap. I also plan on doing these things: calling people "my dear boy"; saying "in MY day, a lady wouldn't be caught DEAD in that"; and indulging in completely unwarranted nostalgia for the mid-to-late 1980s. 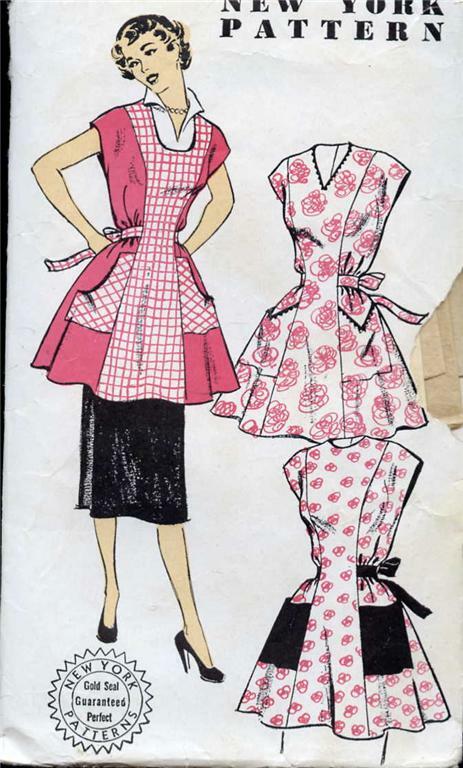 Apron + Dress = Apron Dress! Isn't this adorable? Karen just sent it to me, and, although I'm not much of an apron person (if by "not much" you mean "have fewer than two dozen") I'm very tempted by this auction. I'd be even tempted-er if it were my size (it's B28-30; click on the image fast if you want to visit the eBay auction, because it ends before bedtime). Mostly I'd want to get it just to lengthen it to a dress. Doesn't it look very Duro-y? I love the princess lines and the pockets. I'd do it in blue gingham with pale blue solid for the pockets and tie, widen the tie and probably do a solid band around the bottom. And then I'd go make a pie in it. What more could you want?